With the U.S. budget and financial issues being as dismal as they are, the Pentagon is preparing to cut billions of dollars from its budget, reducing military spending, forces and weapons program. The cuts, according to NBC will put American military forces to its lowest level prior to World War II. The budget cuts will come at a price according to U.S. Secretary of Defense Chuck Hagel: “As a consequence of large budget cuts, our future force will assume additional risk in certain areas,” Hagel said, citing gaps in training and maintenance and a smaller force that would be stretched thin if major conflicts broke out in several places at once. I thought we were already stretched pretty thin. Talk about a nation that sacrifices for the well-being of other nations. We give up so much that our own security is of greater risk. This can only place greater pressure on the forces we keep in place. This is how we show support of our men and women who sacrifice enough as is. 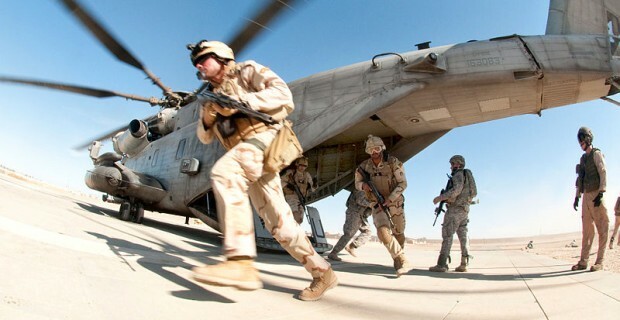 Military cuts will include loss of quantity and quality of protective equipment and weapons. Lets cut to the chase, we can look directly at the money this nation gives away around the world and to benefit who? I know the argument about treaties, promises, humanitarian causes, all of it Our number one priority should be the security of this nation and it isn’t. We may be pulling troops out of Afghanistan, but how long will it be before we are considering redeploying them, does Iraq come to mind? With all the violence, bombing…..wars currently going on around the world, more widespread than anytime in my lifetime (I am 62) we are cutting our military? This is the greatest brain-dead decision our government could make. You can include all that is happening at the border here as well, our border, I’m not talking about Israel now. We don’t know what all is crossing over. I can here all naive Obamaites now…… the you’re nuts crowd. The same ones that believed Obama was the answer of hope. He has been hope not. Seriously, common sense here, would you run your personal budget this way; give so much to others, that you put yourself in a financial position where you can not take care of your basic needs? No, you wouldn’t, most of us wouldn’t. Without securing and keeping our nation safe, nothing else will matter. I am not saying we must withdraw foreign aid completely. If we can even consider cutting our own budget, we must cut foreign aid from that budget, obviously more than we are or will. Some nations we give support, do not deserve it, most hate us anyway. Our military protects or freedom, and our freedom allows us all that we have and need. Our military need our greatest support. We can not compromise our men and women that serve our nation. This answer reminds me of a a kindergarten kid on the Art Linkletter Show years ago. Linkletter would ask each child a question, testing their imagination. The child answers, making up a story having absolutely no knowledge or experience whatsoever, right out of the blue. The childrern use their imagination. Hillary is obviously using empty space, with her B.S. trying to fool the public into believing she knows what she is talking about. She has about as much knowledge and experience as the Linkletter kids. They’d probably have better answers. Gaza is a small place, and there’s not any other location for the group that’s supposed to be demilitarized to run their military operations. I THOUGHT ISRAEL WOULD STOP THE DESTRUCTION OF GAZA IF HAMAS PUT AN END TO THEIR BOMBING. NOW I AM NOT SO SURE. I REALLY DO NOT UNDERSTAND OTHER THAN IT IS A WAY OF LIFE, ONE SIDE WILL NOT BE SATISFIED UNTIL THE OTHER NO LONGER EXISTS. IN BETWEEN PERIODS OF PEACE ONLY FOR REGROUPING. THE HATE IS SO DEEP, WILL HAMAS NOT STOP TILL THEY AND ALL PALESTINIANS ARE DESTROYED ? WILL ISRAEL CONTINUE EVEN IF HAMAS ENDS THEIR BOMBING? THIS ATTITUDE BELOW INDICATES THEY WILL. Does Obama hear himself? Apparently not. The King of Hate…….hates everything American. U.S. President Barack Obama talks about the economy at the Uptown Theater in Kansas City, Missouri, July 30, 2014. President Barack Obama took his criticism of congressional Republicans to a higher pitch on Wednesday, imploring them to “stop just hatin’ all the time” as they voted to sue him over charges he has overstepped the bounds of his office.